The dead are rising... again. Over three hundred years ago, the wize and beautiful Queen Simura lost her only love to a horrid disease. In a desperate attempt to restore life to her beloved Gallanos, the Queen turned to necromancy, and became seduced by the evil power of a mystical tome: the Darklight Codex. Constructing a gigantic maze beneath her palace, the Queen began to gather followers, as the dead throughout the land began to rise. Suddeny, a fanatical group of warrior-priests attacked the palace, and succeeded in sealing the Queen and her followers within their own stronghold. As time passed, the city crumbled, and to most people the story of the Queen is now only a legend Now terror grips the land - children are being kidnapped, plague is spreading, and the dead are rising again. And deep beneath the palace ruins, in the heart of the maze, the Queen begins to awaken from her long sleep, her power even greater than before. While in the Principality of Peka, the heroes become isolated from the surrounding world by a combination of disease quarantine and undead activity. Adventurers will face their darkest fears, as they become entangled in an investigation of ancient evils, unhallowed life and sudden death. This accessory provides characters with a chance for several types of adventure; wilderness, town, and dungeon. Set in a small area on the southernmost shore of Eb'Sobet Lake, your players will be embroiled in a tale of madness, kidnappings, murder, and undying love. How will they manage to survive even one of the many dangers that await them? "Because a picture is worth 1000 words." ImageQUEST is the picture book that gamers love. Now DMs can not only read the boxed text, they can actually show it to the players. * 64 pages of useful background, NPC profiles, maps, encounter tables, a full glossary, artwork and adventure details; no fluff! * Player aids and handouts that your group is sure to enjoy. * Details on the history and legends of the Eb'Sobet Lake area where the players will be exploring. * Includes 2 new 3E prestige classes, 2 new 3E monsters, 1 new 3E magic item, and 1 new 3E spell! To use this adventure, a Dungeon Master also needs the Player's Handbook, the Dungeon Master's Guide, and the Monster Manual. 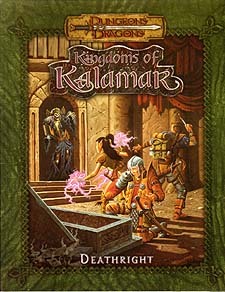 We also recommend the use of the Kingdoms of Kalamar Campaign Setting Sourcebook.